Hello to all of you! I missed sketching with you at Pioneer Square. It's great to be able to see the drawings that have been uploaded. They look wonderful and make Seattle look so charming. 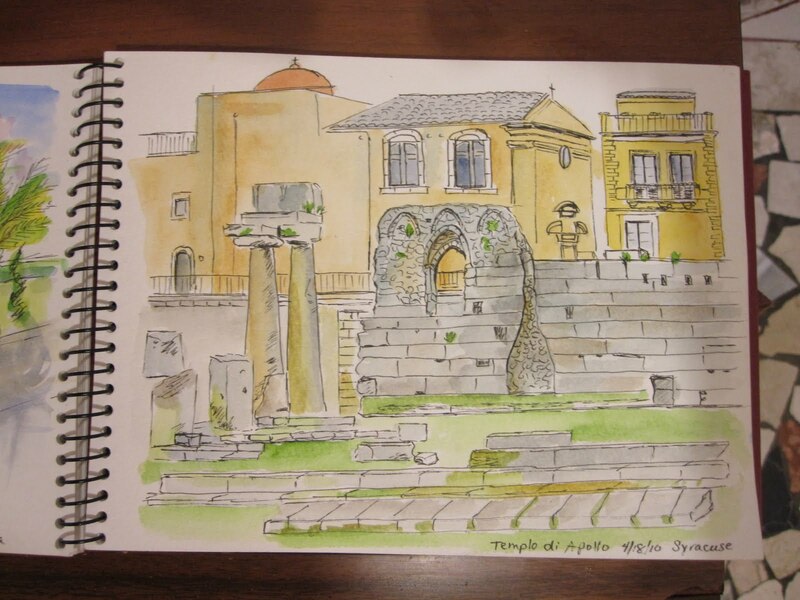 My husband and I are in Sicily now and I'm including my Sketchcrawl drawing of the Temple of Apollo in Syracuse. It is surrounded by a major square where life continues to swirl around. The pillars are the most original part, others having been modified by whatever power was current. In the sun, the pillars glow with soft golden light. We all are jealous of you. Wouldn't we love to be in Italy! Great sketch. Seattle streets could use some old pillars like that for the enjoyment of us sketchers! it's great to hear from you and see your sketchbook from afar! The warm sunshine comes right through! Really terrific to travel with you! thank you for sharing what you see with us this way! Peggy, great capture and story. 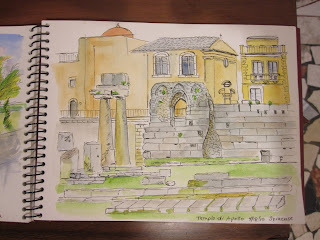 Travel sketches should be savored, they will reward you years from now as you remember the effort. Look forward to hearing about the trip.